Check out our newly redesigned butterfly bracelet! Newly designed Butterfly Name Bracelet. Children's PERSONALIZED Bracelet w brightly colored butterfly beads. 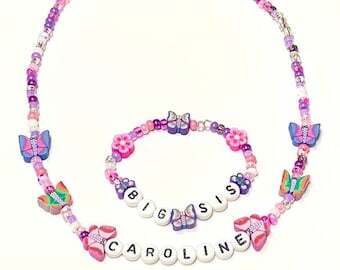 Makes a great Big Sister Gift or Garden Party Favor Bracelet. 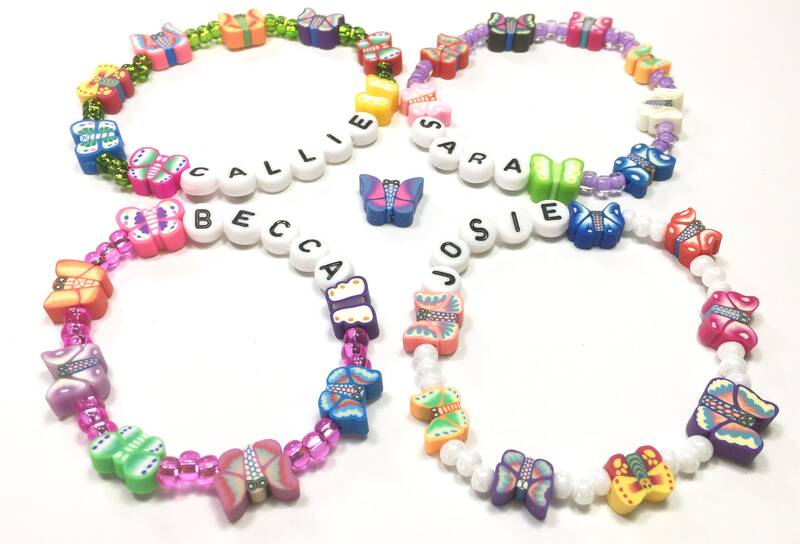 This Colorful Butterfly bracelet can be Personalized with name, phone number, or medical alert info. Ordering this item you will receive ONE butterfly bracelet. Pictures are example of the section of butterflies you may receive on your bracelet. At checkout you will be selected to choose a size and color from the drop down boxes. The c color you choose will be the color of beads between each butterfly. In the message to seller box at checkout please include the personalization desired. There is just one box. SO if you're ordering more than one item all the notes will go in that one box. This listing is for 1 bracelet. When you add the item to your cart just change the quantity desired. As long as you add them all and checkout only once the combined shipping rate will automatically calculate.